I have often wondered if great liturgical music could possibly change the thinking of even the most die-hard devotees of the new Mass. 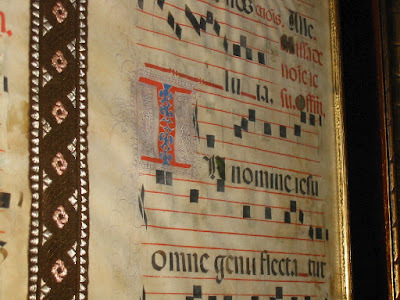 If they were to throw out the banalities and ugliness of their current repertoires, common as dirty dishwater in most of today's churches and just as appetizing, would their minds, hearts and distant memories embrace the beauty of Gregorian chant ? The more I muse on this the more I begin to realize the vital importance of music in our lives. Regular readers of this blog know that I try on occasion to introduce them to musical compositions that I hope they will be pleased to hear. Certainly one's personal taste is an important factor here: one man's meat is another man's cold porridge. Yet I hope that by introducing them to this music it might open up for them some new appreciations for things beautiful. I was lucky. When I was young three motion pictures forever implanted in my brain the greatness of great music. And these three films certainly had great, truly great, music scores. They opened up for me a whole new world of great music, led me to the classics and reinforced what in those pre-Vatican II days the lovely things I heard in church on Sundays. They also saved me from the "pop" music culture that was capturing the fascination of all others in my age group. I was sometimes looked upon as a freak for not having the slightest interest in Elvis, John, Paul, George and Ringo. I wanted well-composed music. [For those interested those three film scores that changed my life forever were "The 7th Voyage of Sinbad" whose score was composed by Bernard Herrmann, "The Robe" composed by Alfred Newman and "Ben Hur" composed by Miklos Rozsa, scores which to this day I never tire of listening to on cd.] Not to be forgotten are my mother and dad who were admirers of lighter but no less delightful musical pieces of the Strauss waltz genre. That too kept me away from banality in music. I've done a lot of stupid things in my life but one of the few right things I did was to expose my children to fine music. I believe all of them maintain a love for great music, be it composed by Beethoven, Prokoviev or Herrmann, all of whose works (and more) they are completely familiar with. But enough autobiography. Can great liturgical music, formed by tradition, bring back to their artistic senses even those whose musical appreciation has been stomped into the ground by what passes for Mass today ? Looking around at a barren church landscape I have my doubts. But we must try to help do so. Speaking to a sympathetic parish priest is a possibility. Letters to the editor ? Reminding the Vatican II sycophants that even that misbegotten Council called for pride of place to be given to Gregorian Chant ? It is also helpful to remember the Gregorian chant "craze" that hit the cd market some years back. They were international best sellers. Interesting. I don't have the answers; I can only throw out an idea or two. Hopefully someone more familiar with these matters could chime in with more solid ideas than I could muster. Today, March 5, marks the fiftieth anniversary of “Musicam Sacram,” the last great document on this subject, published in 1967 with the joint signature of Cardinal Giacomo Lercaro, archbishop of Bologna and president of the “Consilium” for the implementation of the conciliar constitution on the liturgy, and of Cardinal Arcadio Larraona, prefect of the sacred congregation of rites, with the approval of Paul VI. And now the declaration presented below, published today all over the world, sketches an overview of the current state of sacred music in the Catholic Church half a century after that document, an overview that is inevitably critical, and follows this up with eight proposals for a change for the better. The statement has been promoted by two famous musician-musicologists: the Italian Aurelio Porfiri, director of the international magazine “Altare Dei” published in Macao and Hong Kong and an author of books and essays on sacred music and liturgy, and the American Peter A. Kwasniewski, professor of theology and philosophy and choir director at Wyoming Catholic College. We, the under signed—musicians, pastors, teachers, scholars, and lovers of sacred music—humbly offer to the Catholic community around the world this statement, expressing our great love for the Church’s treasury of sacred music and our deep concerns about its current plight. "Cantate Domino canticum novum, cantate Domino omnis terra" (Psalm 96): this singing to God’s glory has resonated for the whole history of Christianity, from the very beginning to the present day. Sacred Scripture and Sacred Tradition alike bear witness to a great love for the beauty and power of music in the worship of Almighty God. 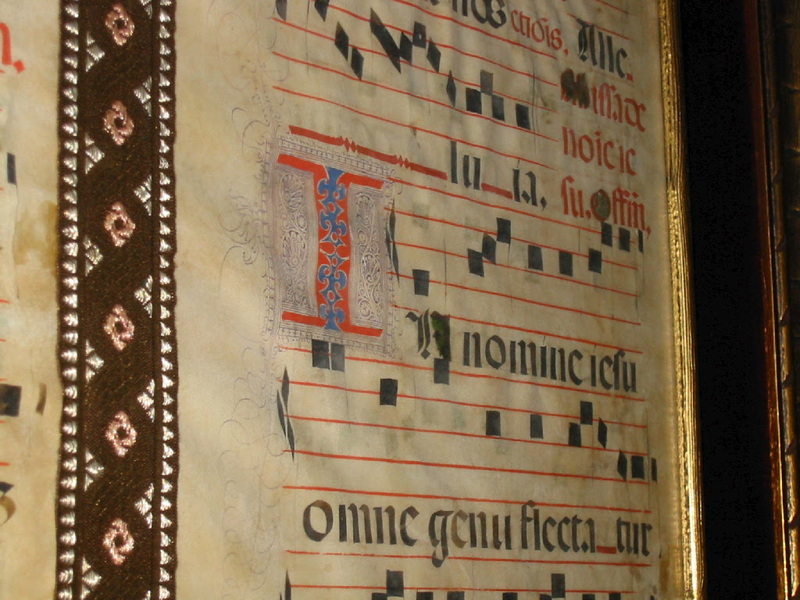 The treasury of sacred music has always been cherished in the Catholic Church by her saints, theologians, popes, and laypeople. Music has its relaxing power.